There is a syndrome among our young people (I’ve actually suffered from it for ages) called FOMO. “Fear of Missing Out” is the concern that one might be missing out on all the action, and it has been exacerbated by the prevalence of social media. People are constantly posting pictures of their good times and memorable moments, leaving those who are not present with a tinge of jealously or sadness that they were not a part of the event. My daughter had a slight tinge of it on Easter evening, when my nieces, sister and I sent her little videos of the fun we were having. She texted us back, “I have a serious case of FOMO.” At the time, none of us could figure out what “FOMO” even meant, but we completely understood once we looked it up online. A week later his disciples were again in the house, and Thomas was with them. Although the doors were shut, Jesus came and stood among them and said, ‘Peace be with you.’ Then he said to Thomas, ‘Put your finger here and see my hands. Reach out your hand and put it in my side. Do not doubt but believe.’ Thomas answered him, ‘My Lord and my God!’ Jesus said to him, ‘Have you believed because you have seen me? Blessed are those who have not seen and yet have come to believe.’ (John 20:19-29, NRSV). While Addie was sad that she was missing out on family who lives far away (that she will get to see again this summer), Thomas felt like he had missed out on the most EPIC reunion of all time. His personal Rabbi, with whom he had spent the last three years living, and for whom he gave up any semblance of his previous life, had died brutally in a public execution. And he missed it when Jesus appeared again. What Thomas would have given to see Jesus again! To touch his hands and feet; to see the wounds on his body. He was filled with grief and remorse that he had missed that moment. Of course we remember him as “Doubting Thomas,” and I suppose it has stuck for so long because it is comforting for all of us who haven’t had the opportunity to “See” for ourselves. Without Thomas and his need to SEE, we wouldn’t have heard these powerful words from Jesus, “Have you believed because you have seen me? Blessed are those who have not seen and yet have come to believe” (John 20:29). Unlike those scared disciples huddled in a locked room, we see because we believe; we don’t believe because we see. Jesus reminds us through his words to Thomas that we receive a special blessing in that. Many scholars and theologians have a lot to say about faith, believing, doubt, and understanding. It’s a little overwhelming to be sure! My favorite for the week came from commentator Clayton Schmidt, writing the “Feasting on the Word” Lectionary Commentary for Easter 2 Year A, “Faith is a mystery of the heart that the mind wants to solve.” It’s ironic, isn’t it, that while we can agree that faith is a mystery of the heart we find entire tomes written to “work out” what faith is and try to rationalize or explain things like belief and doubt. Faith is a mystery of the heart, and when we get our minds too invested in trying to figure it all out, we are actually missing out on the freedom of leaning into that mystery, being enveloped, surrounded, and comforted by it. Take for instance, that wonderfully warm feeling of peace that washes over you in a moment of trial or tragedy. That’s a mystery of faith and it holds fast. . . until our minds get busy (our minds are practicing their own version of FOMO! They don’t want to miss out on anything, so our minds begin their processing). Rather than resting in that peace and soaking it up, we think, “Wait, this is terrible! What am I going to do? How will I solve this?” and then our minds race with all the “What ifs?” and “Whys?” and as our mind becomes more active we destroy that incredible peace that came as a gift of faith; a promise from the Spirit that we are cared for and comforted. It could be what we read about in the epistles: “A peace that passes understanding” (Phil 4:7). But our minds cannot understand it, and more often than not, in our attempt to try and understand or explain it, we utterly destroy it. If there’s anything to be learned about Thomas and the blessing of believing without seeing, it is that we would do well to let go of our need to prove and explain everything. There is a special blessing to be found in a child-like faith: a faith that feels and experiences while engaging fully in the wonder of it all. May you also lean in and embrace the mystery. May you find yourself full of wonder and willing to let go of your need to understand every little detail. May you come to believe in God with all your doubts. We had gorgeous Easter morning sunrise and 10 AM worship services at CEH. In lieu of trying to recap our journey together and the message of the Empty Tomb, I wanted to share this wonderful story I received in the mail last week. I could not write anything more promising or affirming than my new (and old) friend Suzie Brane shared with this congregation! Her story is a testament to how sincerely each of you take our mission statement of being a welcoming congregation with “Open Hearts, Open Minds, and Open Arms.” The story made me laugh and cry and remember how grateful I am to serve you. Enjoy! It started on a Wednesday at the top of the Winter Park & Mary Jane Ski Area, just inside Lunch Rock Café. We pulled up with our chips and sandwiches to share a large round table with skiers Bud (age 83) and Jan, his younger sister by ten years. Delightful back & forth table conversation led to the pinpointing of our lodging for the month of March in The Highlands, just outside of Tabernash, CO. This promptly motivated Bud to tell us about his church located just across the road from our mountainside neighborhood. He spoke with contagious enthusiasm about his beloved church, and their amazing Pastor-Paula. Pure inspiration sat right beside me at the top of that mountain. I could feel it. We told Bud we would certainly look for him on the approaching Sunday when we arrived at Eternal Hills Presbyterian Church. He told us to be sure and get “up close” and personal on Sunday as his eyes were growing old & weary at face recognition. The challenge of macular degeneration was clearly not causing him to “wave the white flag” at life as he set sail to conquer the slopes for the rest of the afternoon. In that small space of time I was more than drenched by his zest for life. As we pulled in the parking lot on Sunday it began to snow. It felt good to be at church. The snow seemed to confirm the perfect beauty of this outdoor sanctuary, even if only sitting in the parking lot. After grabbing everything they had to offer on the back table we carefully chose our pew, not too close to the front, as is our usual cautious way. Immediately I loved the entire Lenten theme of journeying to Jerusalem as I thumbed through the literature. people who held me up, and encouraged me when days were dark. The guest speaker then spoke of his “wilderness experience” as he found himself in one of the Twin Towers on nine-eleven. It was a moving & powerful testimony unlike anything I’ve heard. I could have gone home at this point, my cup more than overflowing. But God was not done with me yet. The wilderness of where we’ve been, and where we’re going is sometimes a daunting voyage. But as we put our trust in this GPS-Jesus, it does indeed; make all the difference in the world. We will not be lost. It is everything, this Jesus–everything. So thank you 83-year-old Bud & amazing Pastor Paula. Thank you Susan & Judy–and the entire family of Eternal Hills Church. You handed me a compass, walking stick, and a drink of much needed living water to continue the journey. It was exactly what I needed. I am once again amazed and inspired by our good-good Father who brings us these unexpected gifts if we will but watch for them. Blessings to you, my mountain church family-! God’s hand has been at work through YOU-! Until next time—peace & the love of our Savior to all. We’ve arrived at our destination. You may have thought the empty tomb was our destination, but here, at the end of our Lenten journey, we find ourselves outside of a sealed-up tomb as night falls. This is where we’ve been headed all along. The nature of the Passion is such that we need to stop here; pause for a bit in wonder and awe; marvel at how this journey brought us to this point. Sunday morning at our 10 AM worship, we began with a loud and palm-waving entrance. Our shouts of “Hosanna!” and our songs of praise led a parade of children and kids-at-heart right to the baptismal font, where we celebrated the baptism of baby Noelle. Everything was perfect — the baby didn’t flinch or grimace when I poured the water over her voluminous black hair, and she smiled and cooed at each of the congregants when I paraded her around the sanctuary for her blessings. My heart felt especially full as I watched the face of Noelle’s maternal grandparents and her eight-year-old cousin, all of whom spoke no English, hear the translation of the liturgy from our translator, Kathy Naples. Because they had traveled all the way from Paraguay for this momentous occasion, we indulged a little bit and had the liturgy in Spanish as well. The light in their eyes and the smiles of peace upon their faces told me we did it right. And the smiles on the faces of the congregants, and the tears I saw in many people’s eyes, reminded me how precious our baptismal service has become. We certainly have a ritual that involves many people — from the children who bless the shells to the people who have brought in shells from so many different locations; from Jocille who ordered and picked up the cake to Betsy, who stitched together the keepsake quilt; from Sue coordinating fellowship to Patti and the choir planning out a special song for the parents I think there are over 40 people involved! “Many women were also there, looking on from a distance; they had followed Jesus from Galilee and had provided for him. Among them were Mary Magdalene, and Mary the mother of James and Joseph, and the mother of the sons of Zebedee” (Matthew 27:55-56). And us. We’re here. We made it. Now we stop to ponder this wondrous love, as we gaze upon an empty chancel and the cross draped in black. Through this week we’ll continue to wonder, read through some of the other Gospel accounts of Jesus’ death, we’ll stop on Thursday at the table, be blessed in the washing of feet, and on Friday, gathered with believers from around Fraser Valley, we’ll venerate the cross one last time before we enter into the darkest days of our faith. Thanks for coming with me on this journey. I feel we have so many reasons to be in wonder, and it is more satisfying to wonder alongside each of you. May God bless this week for you in new and challenging ways, and may you grow in your own understanding of this holy mystery. Monday — Saturday, continue your study of the GPS (included below or available at Welcome Center in our foyer) and the readings from the “Meeting Jesus” devotional. Tuesday — Noon and 5:30 PM — Lenten Study. Lunch is served at the noon study, and the 5:30 study will be abbreviated this week due to another ministry at the church starting at 6. As Reformed Christians, we have an abbreviated version of the Paschal Triduum; we still celebrate Maundy Thursday and Good Friday in full fashion, but our Easter Vigil is quite different. Thursday — 7 PM at CEH Maundy Thursday Service. “Maundy” from the Latin “Mandatum Novum,” or the “New Mandate” that Jesus gives to his disciples at the feast of the Passover in the upper room to “Serve One Another in Love.” We observe this mandate by mirroring Jesus’ actions that night in a holy and sacred ritual of foot washing. This intimate, humbling ritual is one of the most moving of the year, and I encourage you to come forward in courage. This year you will be able to wash your own hands if you are uncomfortable with me washing your feet. We will break bread together in communion. Friday — Good Friday, 7 PM at St. John’s Episcopal Church in Granby. We will use this time to hear the Passion again, this time from John. This very traditional service includes time to “venerate” the cross, which means to stop and adore it. Saturday — The Great Easter Prayer Vigil. From the end of the Good Friday service to the break of dawn on Easter morning, CEH members will be engaging in our version of the “Great Easter Vigil” by filling that time with prayers. You can devote yourself to prayer any time that day, or you can add your name to our list of hours and pray during that set time. Call the church office to sign up for any available hours. I am preparing the Prayer Vigil guide, which can be emailed to you or you can stop and pick one up at the Thursday and Friday services, or in the office starting on Wednesday. You can also let yourself into the church to engage in the prayer stations any time on Saturday. If you take your time at each station, you can easily fill your hour time slot with prayer. 7:00 AM — Sunrise service of song, scripture, and communion. 9:00 AM — Service Station — our all ages mission opportunity. We’ll be packing hygiene kits for the Presbyterian Disaster Assistance. 10:00 AM — Worship and Praise — quite a celebration! Meet in the Fellowship Hall and we’ll process into the Sanctuary together. Following the 10 AM service — Fellowship and an Easter Egg hunt for the little ones. Please join us for these last days of Lent and the beginning of an entirely new journey into celebration! During this last week of Lent, we will be looking at scriptures that allow us to journey with Jesus during his time in Jerusalem on the last week of his earthly life. Use this devotional time to grow closer to the one who gave up everything for you and the rest of God’s children. This was no ordinary parade. This was Jesus engaged in street theater. Jesus is making a statement against the power, violence, and exploitation of Rome. While Roman officials would have ridden into Jerusalem on war horses, Jesus chose a symbolic animal of peace. God’s power is not measured by the world’s standards. God’s power is located in a peasant who peacefully rides into a city that will kill him in five days. What are some ways that we could participate in non-violent demonstrations that showcase God’s love for everyone? Jesus wastes no time in liberating God’s house for God’s people. It’s one thing to talk about justice. It’s quite another to participate in liberation. The money changers were making a huge profit by exploiting the poor. All throughout the Bible, God has been on the side of the oppressed and the marginalized. This is no exception! How can we work alongside God in proclaiming justice for all? This passage shows God’s full range of forgiveness and devotion to God’s people. Jesus is expressing remorse that Jerusalem won’t listen to him. Not because Jesus is mad at them, but because they are choosing to live outside of God’s desire for them. Even though this is the city that will kill Jesus, he still prays for them and wishes to gather them home. How does it feel to be connected to a God that loves you despite what you do? Our God is ALWAYS on our side and desperately wants the best for us. Communion was central to the life of the early Christians. It was a meal where they talked about their day and shared their lives with each other. Jesus is taking this opportunity to break bread with his closest friends. It has since become a ritual in Christian worship, but the heart of communion is still sharing a meal with your church family and God. Jesus shared this table with the one who would deny him three times and with the one who would betray him. Jesus extends an invitation to this table to everyone who wants to partake. Matthew describes this event with rocks splitting and the earth shaking. The death of Jesus shook even the foundations of the world. It should shake our foundations as well. Do not fall into the temptation of reading this event as something that happened 2000 years ago. The injustice that Jesus stood against and eventually died for is still alive and well in our time. What are some ways that we can shed light on the problems of inequality, racism, and bigotry. If we are not willing to work for justice, then we might as well be the bystanders in this passage who witnessed the death of Jesus and did nothing to stop it. _ God of commitment and righteousness, we long to follow you to the very end. We acknowledge that it is beyond difficult for us to walk the path that you would have us walk. Give us strength and courage to complete this journey and proclaim new life in you. When we stumble, lift us up. When we doubt ourselves, remind us that we were created by you. When we doubt you, remind us of your power and grace. And when all we see is death and destruction, remind us that with you is abundant life. In Jesus’ holy name we pray, Amen. 8:30pm Friday evening through 6:30am Sunday morning, to be done at home, in your car, wherever you are. Please call the office at 970-887-3603 if you would like to volunteer for one of the 1-hour slots. We are on the road! We’ve covered tons of ground but now we begin the steep climb towards the ultimate destination: a triumphant entry into Jerusalem; the upper room for a Seder together; the Garden at Gethsemane; Golgotha. Sunday we took a brief look at the way Jesus’ acts of mercy were impeded by the religious leaders of the time. When they called Jesus out for not following the law to the letter, Jesus called them out for leading insincere lives of hypocrisy. He told them they look clean on the outside, but they were filthy and impure inside. “Woe to you!” he cried to the scribes, the pharisees and the lawyers. I say “brief” because we covered only two small passages that have to do with upsetting the religious leaders and challenging the status quo. In reality there are hundreds of passages where Jesus does something a bit outside of the law and causes the religious leaders to question him. Not that it was difficult to do something “outside of the law.” Even forgetting to wash your hands before dinner was a violation. And this is what Jesus did in both of the passages we looked at Sunday, but he did it intentionally to challenge those who were keeping track of his movements. In calling attention to the ways that the “Honorable and Righteous” leaders of the time were clean on the outside and dirty on the inside, Jesus calls us to attention too. Are there areas in our life that are rife with sin? Places where we look clean but are really dirty? We sure don’t like it when people point those places out to us, do we? Pew-sitters across the globe get all tingly and happy when they hear an uplifting sermon about the miracles, healings, and the “Love your neighbor” admonishments Jesus makes repeatedly; but there is an awful lot of squirming in the pews when we begin to talk about sin. Welp, there’s truth in that for sure. We squirm and fight against the idea of sin being present in our life rather than acknowledging its presence and choosing to look at it as an obstacle that can be overcome. With effort, we can push that obstacle of sin out of our way and move on in the light. And what we know about obstacles on our trails and roads here in Grand County is that they rarely keep us from trudging onward, heading towards that next mountain peak or whatever promised vista is our intended destination. Indeed, as we hike the trails around here, we are more likely to join efforts to clear every obstacle along the way rather than just turn around or feel dejected or hindered by the fallen trees or rocks that have tumbled down the mountain and onto the path during the long winters. And we extend considerable energy to remove those obstacles not only for our own journey, but for the benefit of those who will travel that same trail later. What a cool world it would be if we expended the same amount of care and energy to remove the obstacle of sin from each other’s lives. I mean, we’re always going to have sin in our lives; there will always be sin in this world; but how better would our life be if we encouraged and worked alongside one another to continue on this glorious journey, unfettered and uninhibited by even the most insurmountable obstacles? As we continue towards Jerusalem in the coming weeks, let’s not think of the cross as one of those obstacles, but rather the gateway to overcoming any obstacle that will ever come our way. The prayer stations are available during regular church office hours (10 — 4 M-Th) for anyone who would like to spend some time in contemplation and meditation. The centers are self-guided, with instructions at each station for how to proceed. Please take a moment to enrich your own prayer life by spending some time at your leisure to study and pray. We are near the end of our journey! Sunday we barely touched on the controversial acts of mercy that Jesus performed that enraged the religious leaders of the time. Our Tuesday Lenten study will include deeper readings of the scriptures from the previous Sunday. You will also get to engage in “Prayer Centers” from week to week that will guide you to a deeper prayer experience. If you are unable to attend on Tuesdays, the Prayer Centers will be open when the office is open during the week, and study guides will be available to help you through the centers. Each week we will be coloring in a beautiful banner designed by local artist and CEH Member Laura Veenstra. Each week at the Service Station, the prayer centers, and during our Lenten Study time, we will be coloring in a section of the banner that coordinates with the week’s theme. The banner will hang during our worship services to be a visual reminder of where we are headed in our journey. There is a cross that was fashioned from the CEH Christmas Tree (thank you Stephen Eddy!) that will journey from the foyer to the Chancel throughout Lent. As we progress on our journey through Jesus’ life, we will be bringing the cross closer and closer to the front of our sanctuary as a reminder where we are headed. There will be activities throughout the worship service, focusing on the cross, that give you an opportunity to deepen your commitment to Christ. Each week you will receive a “Grow, Pray, Study” Guide to deepen your understanding of the life of Christ. Like a GPS Navigation system, your GPS will guide you through this journey. The kaleidoscopes during Advent were so successful, we looked for an appropriate symbol to hold onto for this Lenten Journey. The children will be receiving their own “Compass clip” that they can put on their backpack or carry in their pocket. This compass will be representative of needing God’s guidance and direction in our lives. These are available for adults if you would like a physical reminder to let God be your guide through life. The 2017 “Presbyterians Today” Lenten Devotional contains 47 short, 1st Person Readings from people who encountered Jesus. This is an excellent way to challenge yourself to daily contemplation on the Word and on the life of Christ. 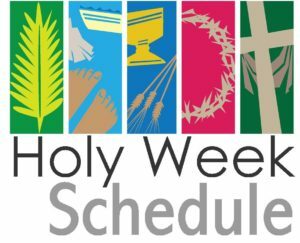 We will have our regular Monday and Tuesday studies, with an additional service on Maundy Thursday, and an ecumenical service at St. John the Baptist Episcopal Church in Granby for Good Friday. We will cover the darkest hours of our faith with prayer, from Friday night after the Good Friday service through sunrise on Easter morning. You can sign up for a one (or more) hour slot during which you can pray and be in meditation. Pastor Paula will make a Prayer Vigil Guide for your time of prayer. Don’t worry! The guide really helps you through the hour of prayer and meditation. Sunrise Service, followed by a breakfast will begin our day with worship and fellowship. After breakfast, we are sponsoring an Easter Egg hunt for our entire community, in hopes that they might stick around for the rest of our festivities. Our Service Station will be really amazing for this holiest of days, so plan to come at 9:10 if you would like to participate in being the hands and feet of Christ to a hurting world as we make “Gift of the Heart Kits” for the Presbyterian Disaster Assistance. Our 10 AM service will be an incredible celebration of the empty tomb, beginning in the Fellowship Hall and moving to the sanctuary to roll the stone away! All of these resources can also be emailed or mailed if you cannot pick one up from the church. We are near the end of our Lenten Journey. Up to this point, the path has been pretty well-paved; a comfortable path for walking with a group of people and to stop and admire the view and drink in the goodness of our story together. But now the road begins to narrow and we face some obstacles. Read about Jesus’ three year stint Teaching, Preaching, and Healing in the article below.